Kings 2 Light: Four kings are placed off to the side and two cards are selected and lost in the deck. The four kings INSTANTLY and VISIBLY change into one of the selected cards, wondering were the kings went, you spread the deck to find the kings face-up with one card face-down between them, of course you guessed it the other selected card. Walking To China: A VERY clean two coin transpo with a JUMBO finish! Chasing Ackerman's Back x3: Justin takes Allan Ackerman's small packet all backs routine to another galaxy. Cylinder And Coins: Justin's take on Ramsey's masterpiece. Second Print: So that is how playing cards are printed (this is Justin's opener at tables)! "Justin Miller's coin work is Olympic caliber level. As smooth, effortless and seamless as anything you could hope for. Miller gives new meaning to the term 'natural'." 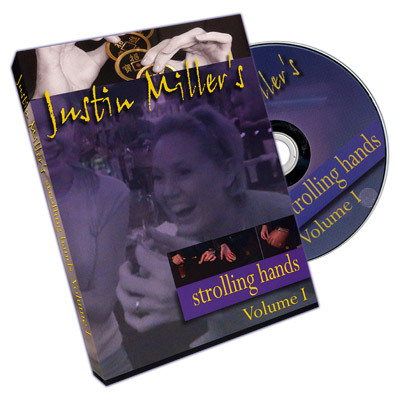 "Justin Miller has fooled me and other working professionals with his original creations with cards and coins on a constant basis. He continues to amaze me with his truly talented and very creative sleight of hand. Whatever you do, don't blink!"